The workbench can get quite messy at times. Quite a while ago I had the opportunity to purchase a vast horde of Wargames Foundry figures from The Tin Soldier in Sydney. The Federal Government had just introduced the Goods and Services Tax into Australia and the local businesses were unsure how exactly they would manage this new imposition upon their everyday financial practices. Gary at Tin Soldier had taken all the Foundry figures off the racks. In those days you could still purchase the Wargames Foundry figures individually and he was going to be damned if he had to transact a 10% GST on 55 one figure transactions etc!! His decision was my gain as I made him a "Job lot" offer on thousands of figures from the Napoleonic, Ancients, Medieval, Dark Ages and Franco-Prussian ranges at an absolute song. The only bugger was you got what you got. In other words there may be ten French Napoleonic Fusiliers figures marching in one pack and 24 Fusilier drummers and standard bearers in the other! Fortunately that was the extreme however there were some eclectic figures that I scratched my head with and thought "What the heck am I going to do with them?" The younger wargamers reading this may think what teh fuss is about? Surely skirmish games would want figures like these all the time. However in my early days as a wargamer we desired our rank and file to be almost uniform in pose and stature. How amazing now to think that we want variety, especially subtle variety in similar poses such as Elite Miniatures and Perry Miniatures do so well today. These Young Guard figures lying down and sitting were just the ones who fitted that last statement perfectly. So they sat in the WF box (that's Wargames Foundry box, not what you may have been thinking), for sixteen years. General D'Armee appeared. In case you haven't noticed I am very much a devotee of these excellent rules from Dave Brown. They allow Brigade skirmisher screen to be formed by having each battalion provide a single base of three figures. 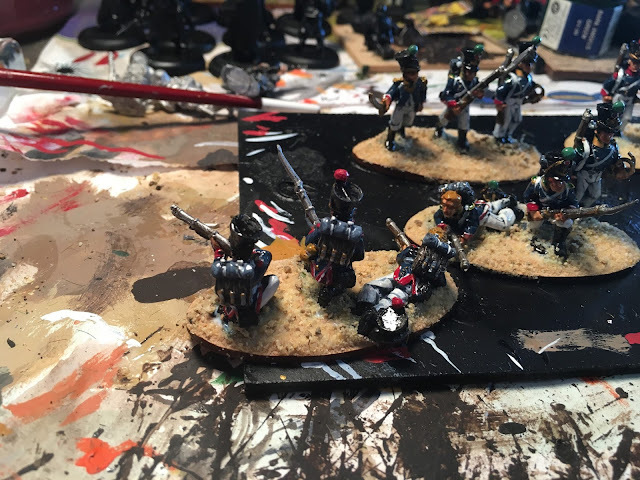 I have elected to place these on a distinctly different oval base from Warbases (excellent company by the way)..
As per my usual practise, I gloss varnish all these figures and then Dulcote once the base is dry brushed and flocked with static grass and tufts. The extra protection, especially for skirmish style stands which do have a tendency to be knocked around and tipped over in the heat of battle, is invaluable. I hate having to patch up scratches and chips! In the old days of WRG etc. skirmishers were simply picked out of the back rang of you battalion and placed in front. Invariably they had the same marching or "at porte" pose. However in GdA you have some scope to be a bit more creative. The lying figure has his shako by his foot. I may need to scuff up the soles of his shoes a bit now that I think of it. 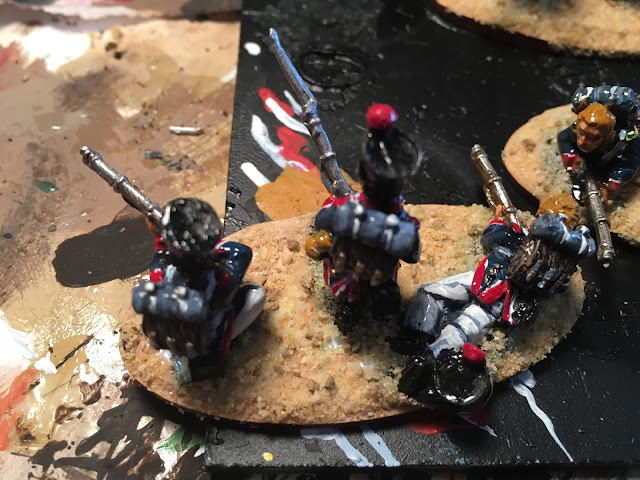 I thought, as I do have the Young Guard at Waterloo 1815 I would have some specific skirmisher bases for them. I know their is some minor variation in the uniform depending on the year however these will do for covering 1813-15. Once they are completed I will post them up to see how they look on the table. Nice variety of poses as you say. look good. Thanks Kevin. I’ve now completed them and dulcoted the boys and they are going to do a good job for those Tirauliers and Voltiguers. Carlo that sounds like an excellent purchase from Tin Solder. I don't even remember seeing Foundry figures there - but perhaps I was still heavily focused on microarmour at that stage. I've never thought of doing the Dullcoat once the base is all finished. Do you do that with your close order stands as well. It certainly was Richard. I still remember getting a taxi straight to George Street and the Dymocks Building every time in flew into Sydney for work and I would have a list of what I wanted to bring back to Perth for my next project. They had a cranky bearded chap working there who seemed yo know what he was about but could be quite “Black Books” rude at times. There was full wall stacked with packs of WF figures in bags which you took up to the counter. They would open the bag, pop one out, staple it up again and put it back on the shelf. I still have masses of them. Yes I gloss varnish everything these days and dulcote afterwards for extra protection. I find it specially with metal lance tips these days it is quite easy to scratch and chip paintwork. The varnish combination is a great protective barrier. Very nicely done and I agree GdA is a great set of rules. Thank you John and I could not agree more. Excellent Napoleonic rules set and I gave been poring over Daves “FAQ” sheet for a few hours now. Good document with some very sensible additions. Sounds like a fine use of od figures from the W*F box, LOL! Thanks Peter and btw, every wargamer needs on of those W*F boxes as you well know.